When we consider the nature of consciousness, it's funny to look back at ancient mankind and realize they were closer to the truth than the so-called moderns, many of whom viewed ancient man with condescension. Let us take the ancient Israelite religion as an example. The ancient Hebrew "nephesh," the word for what might be called consciousness today, meant literally breath, an animating breath that brought the body to life. Thousands of years later, scientists talked about the brain, neurons, synapses, all of that. But we know it's easier and better to conceive of the mind as a mist, not contained within a brain, but spread throughout space, yet able to concentrate in smaller pockets, and not just that, but able to concentrate in multiple places at once. It wasn't just the ancient tribes of Israel that sensed the true nature of things. As another example, many of the Buddhists also had a much better picture of reality, while the mass of men led lives of quiet ignorance. One of Buddhists who was on to something once said "the biggest illusion is I'm in here and you're out there." But as far as we can tell, it wasn't until the year 3,027 (to go by the calendar used at the time) that man really learned of mindspritzing. Yes, there had been isolated moments prior to that - in dream states, through meditation, drugs, etc. - but not until 3,027 did what we know as mindspritzing enter the human world. Below is a narrative explanation from Mast Brothers of how they make chocolate, and we all know these are honest, traditional chocolate artisans. "We begin by literally hand-sorting every bean, ensuring our impossibly high quality standards are met. The cacao is then lightly roasted in small batches. A clean winnow gently removes the shells from the 'nib'. The nibs are slowly refined under a granite stone wheel for nearly three days while we slowly incorporate the other ingredients. The finished chocolate is poured into bar shaped moulds, cooled, set, and then wrapped. Our signature papers wrap the chocolate using antique equipment, repurposed to our custom style, and then labeled. Now the chocolate is ready to be shipped!" As you can see, the Mast list, seems to include in what other lists is sometimes "grinding" and "conching," which seem to be separate processes. But what separates grinding and conching? ?? The hot sun, the pulsating nuclear furnace, blasts heat onto the hills of Nicaragua. The rich, fertile soil. It nourishes the cacao trees, on which the special pods sprout. Later, a fine morning mist refreshes the pods. Later, it's time. "Vamos, hombres!" The men move with delicate, precise force: thrashing the pods from the trees with sharpened machetes. You can hear the glistening machetes swooshing through the air and then slicing the pods and the slight thump as the pods hit the ground. All the pods are collected, and the sun stays but the hills turn their backs. Choice lines from coverage of Mast Chocolate, a Brooklyn-based cacao, bean-to-bar shoppe. "About five years ago, I heard a Brooklyn butcher with an M.F.A. describe the look in his neighborhood as “country gentleman.” He meant: elaborately antiquated facial hair, tweed, monocle or pocket watch, top hat or hunting cap, somewhere on the spectrum between Willy Wonka and D. H. Lawrence’s gamekeeper. Probably this person was eating a home-brew pickle, on his way, via leather-handled bicycle, to try some fire-escape charcuterie paired with small-batch heirloom cider." "The brothers Mast, Rick and Michael, are chocolate-makers as Wes Anderson might have written them." "As the kings of craft chocolate, they were not humble. “I can affirm that we make the best chocolate in the world,” Rick Mast said, in an interview with Vanity Fair, last year." "It has thrown into question not just the provenance of a chocolate bar, but the predilection for such goods, with perhaps larger implications for the picked-by-hand, farm-to-apartment movement, underscoring the fact that claims of homespun authenticity are not regulated, or often verified." "When expert tasters bite into bars, they look to see if the chocolate is, in Yuh’s words, 'true to the bean.'" My investigations the other day troubled me and made me melancholy. Is garlic sweet, savory, both, or neither? There are sweet things - nothing need happen for the sweetness to be apparent. A strawberry is just sweet. Are there savory things which are just savory? Beef you might say? But no! The beef will not taste savory unless heated, or without sodium. Same for anything else one can think of as savory. So we must conclude that sweetness can reside as a self-manifesting property that certain foods posses, whereas savoriness only obtains from a process, be it through heat or interaction with another substance. Considering an interaction, the second substance added, for the same reason, cannot possess savoriness in and of itself, but only through interaction with the first substance, by which a reaction occurs, producing the quality of savoriness. To return to the matter at hand - garlic - it must be the case that although sweetness can exist as an inherent quality, and savoriness must always be through a process, there is at least one substance - that substance being garlic - in which sweetness is not inherent but obtains through a process, as well. And not only that, but this very same substance - garlic - can transform into both sweet or savory! Moral of the story: I want garlic bread. Garlic is savory or sweet or both? Or it depends on what is done with the garlic - if you roast and add honey for a spread it's sweet, and if you sautee with salt and olives for a tapenade it's savory. Adding an ingredient - salt, honey, sugar, etc. - is one thing, the mode of cooking - roasting, sauteing, frying, poaching, dehydration, etc. - another thing. And if we say the savory or sweet is within, and either ingredients or preparation or a combination brings out the sweet or savory, is there any real distinction here? Whose garlic this is, I think I know. I'm busy -- work, drinks with clients. Of chicken and fresh garlic! But where are the bulbs of garlic? But the dehydrated, powdered variety. Work, drinks with clients, you know. Went to two tavern style pizza houses this weekend: Lynwood, Cafe in Canton, Mass. and Colony Grill in Stamford, CT. Both great. Perhaps I like Colony Grill more? Yes I do like it more. The pizza with hot oil and onions is REALLY GREAT. Like, oh my god. This week is going to be super cray. Danny Bowien is opening up a new Mongolian noodle parlour in Inwood, and April Bloomfield is opening a new bistro in Prospect Heights. 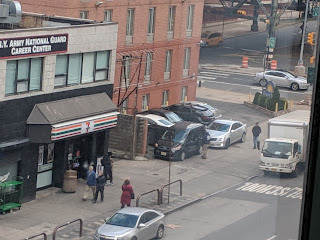 Not to mention I need to write my regular weekly roundup of recaps of critical reviews, plus my regular weekly update on minor openings and closings, plus I need to update the Top 50 Hottest Restaurants in Manhattan (and the other one for Brooklyn), plus my 10 other required filings. Like, seriously? But I love this, I love this world of food. Oh, I need to, like, write a tweet directed to some hot food media person that shows I'm funny and sweet, congratulating that hot food media person on some incredible accomplishment, like being promoted to chief Staten Island correspondent. That person so deserves it! But not really - it should have been me. But seriously, food is important. It tells us who we are and who we want to be. Because I'm a food writer I can write with authority about the meaning and politics of food. Oh my god! Ok, gotta go meet someone for drinks but don't worry I'll tweet it! In the summer of 2000 I moved to New York, my first apartment on West 98th Street near Broadway. I walked around my new neighborhood and one night happened upon a slice shop with neon signs, signs that beckoned to me. I entered. I ordered a slice. It was great. An incredible New York slice, with salty, tangy cheese. The two Italian men manning the shop were efficient and gruff, one slightly more pleasant than the other. I had had my first Sal and Carmine's experience. Sal (the more pleasant one) passed away in 2009. 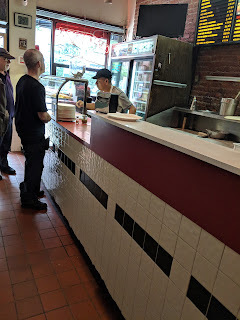 Sal's brother Carmine, and grandson Luciano, continued making some of the best pies in the city. Carmine, sadly, seemed to decline, but he was usually there. Luciano carried on the tradition. Around 2013 I left the neighborhood, but would return now and then for a slice, and Luciano was always there. Fast forward to late May of this year. I went to Sal and Carmine's, and upon entering, Luciano was nowhere to be found. There was a man I had never seen manning the pizza oven, and a young lady (who was way too friendly for Sal and Carmine's) taking orders. Normally at Sal and Carmine's, there would be maybe 3 or 4 pies, often less, sitting on the counter, waiting to be ordered. This time, there were far more, including a white pizza with globs of ricotta. I hesitatingly ordered a regular slice, but something wasn't right. In recent years I did notice that Luciano had people working for him, but Luciano, the heir, was always there. Was he taking a day off, and leaving the shop in the hands of others? I took a bite of the pizza, and it just wasn't the same. The crust was not the same. The cheese didn't seem as tangy. It wasn't a bad slice, but it didn't possess the Sal and Carmine's greatness. Interestingly, I noticed new pictures placed on the wall, pictures of Sal, Carmine, and Luciano. But where was Luciano? I started to feel queasy. Had Luciano sold the family business? Yesterday I returned and, again, Luciano was nowhere to be found. The same man who had manned the oven the previous time was there, this time alone. 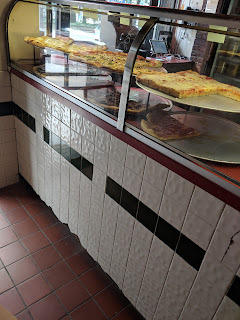 There was the white pie, and also a pie with lots of veggies on it, a pie that would never have been sitting around in the Sal and Carmine, or Luciano days. "Where's Luciano?" I asked? The man said something about not seeing him recently. "Does Luciano still own this place?" I followed up. The man seemed a little nervous and said "yes." Perhaps Luciano does still own but has completely walked away from the operation? Or perhaps the business has been sold? All I know is that Sal and Carmine's feels different.